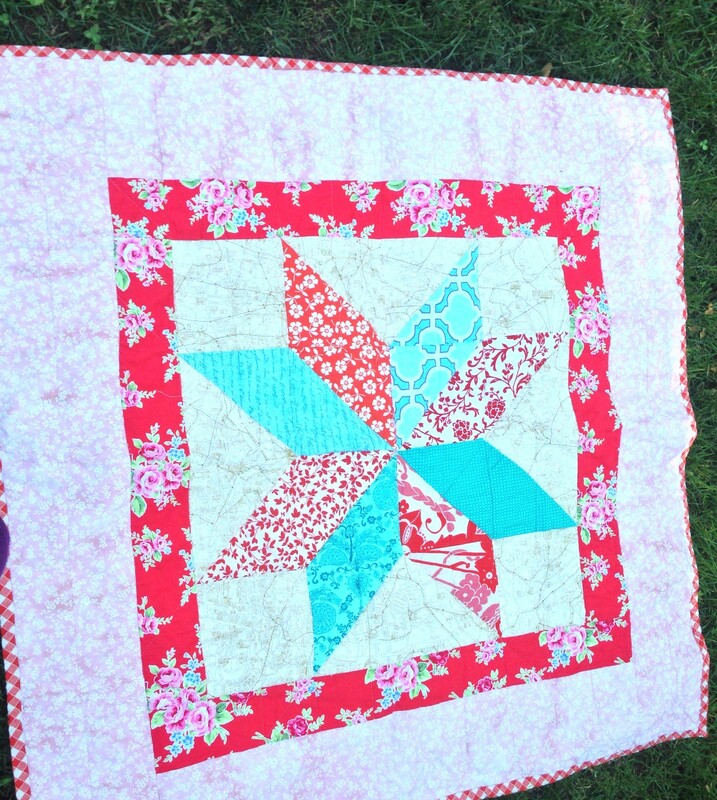 This is one of three aqua / red / blue baby quilts I am trying to finish for Project Linus as soon as possible. I have several orphan blocks made earlier this year when I thought this color combination was the bee’s knees. I still do think it is the bee’s knees; however a random assemblage of blocks is not as cute as I thought it would be. So I stopped and am converting the orphan blocks into 3 project Linus quilts. This is the first one – one of my favorite blocks – the 8-pointed star – rendered big. 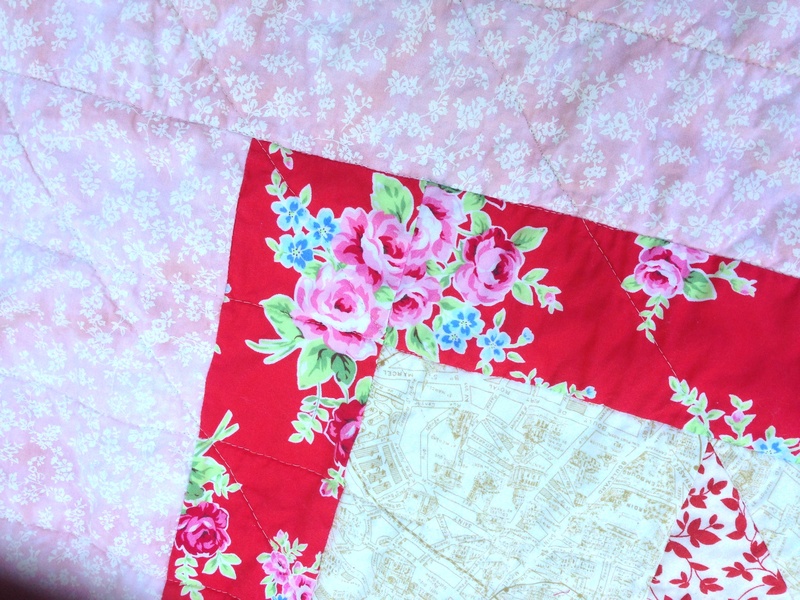 To finish, I added some borders – a pretty red floral and a soft pink fabric that I have had for years and never seem to run out of. I backed the quilt with some fabric from Joann. I love these bright blue butterflies. Still more fabric that I have lots and lots of – although I am starting to see the end of it. I quilted simply – lines radiating out from the points + 3″ lines. And a gingham-y binding cut on the bias. Love the binding most of all of this quilt. It is satisfying to see these blocks get made into something useful. And now I have 9 out of 12 Project Linus quilts finished for the year. I am about to power through the rest. My goal is that in 2 weeks – by 10/10 – all of my charity quilts will be finished and I will dive into some seriously selfish sewing. 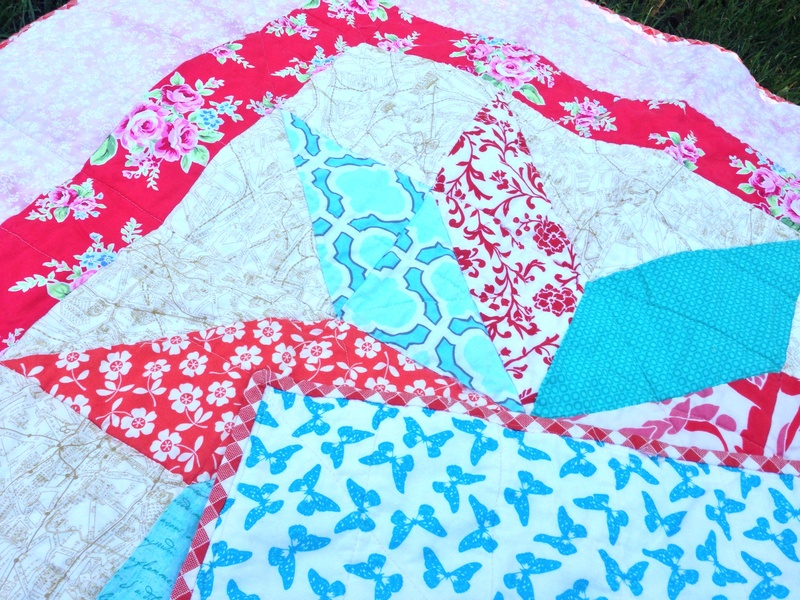 Linking to Crazy Mom Quilts for Finish It Friday!